Often we make the wrong choices when we look for something to eat in the office. At work it’s normal now to grab a piece of cake from meeting leftovers or graze from the never-ending stream of unhealthy snack selections placed in central places at work. The major redeemer of ‘negative nutrition’ appears to be water in the workplace, a new study reveals. Professor Carolyn Thomas and her colleagues in their new research looked at individuals eating habits in their workplace. The team recorded people’s level of self-control at work, where and what they ate during the day. They noticed that consuming the correct foods can increase work performance. Skills such as focus, diplomacy and patience are often needed for a job and these can be improved by foods that help body and mind function at its highest capacity. Control is a big issue in the workplace eating environment. Workers who bring prepared wholesome food with them are the best planners, but even they suffer when scones appear at a meeting or a birthday cake magically turns up. 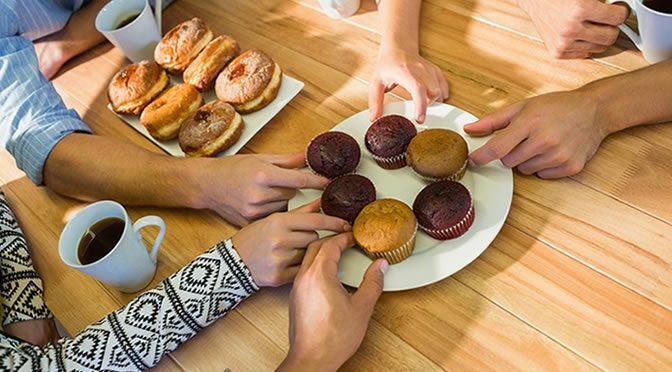 As one of the study’s subjects mentions, sometimes two hours of a morning meeting is occupied by the thought of eating unhealthy treats displayed in the room. This means lots of time and energy are used at work to negotiate countless feelings about food. The authors looked into a new phrase, the “food altar” — where all the unhealthy treats are displayed at work. “…tracks the creative ways in which office workers navigate the daily gauntlet of food altars, candy dishes, and other unexpected food offerings. Water in this research appeared to be the key to solving this issue. Easy access to water at work offered a sense of control against eating unhealthy treats. Apart from dehydration, it encourages movement and changes the food geography in the workplace. “I’m thirsty but I drink water so that I won’t snack as much. The study was published in the journal Food, Culture & Society: An International Journal of Multidisciplinary Research (Thomas et al., 2016).